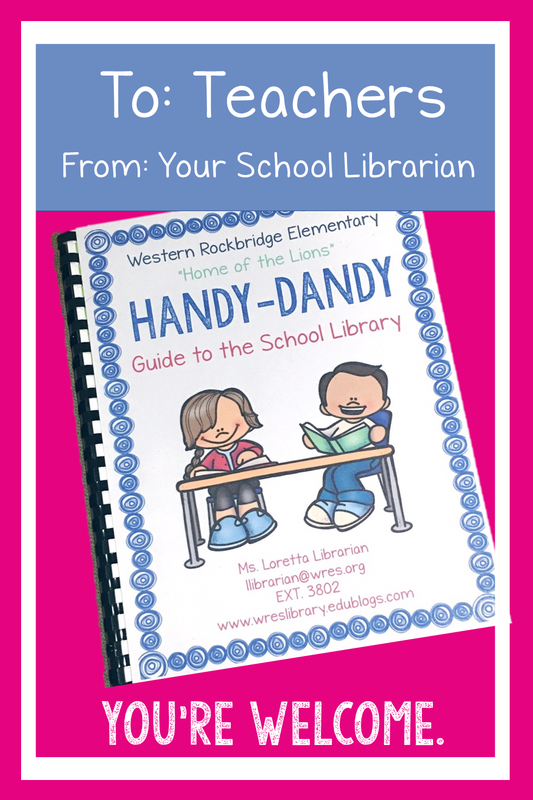 Mrs. ReaderPants: Introducing...The "Handy-Dandy" Guide to the Library! 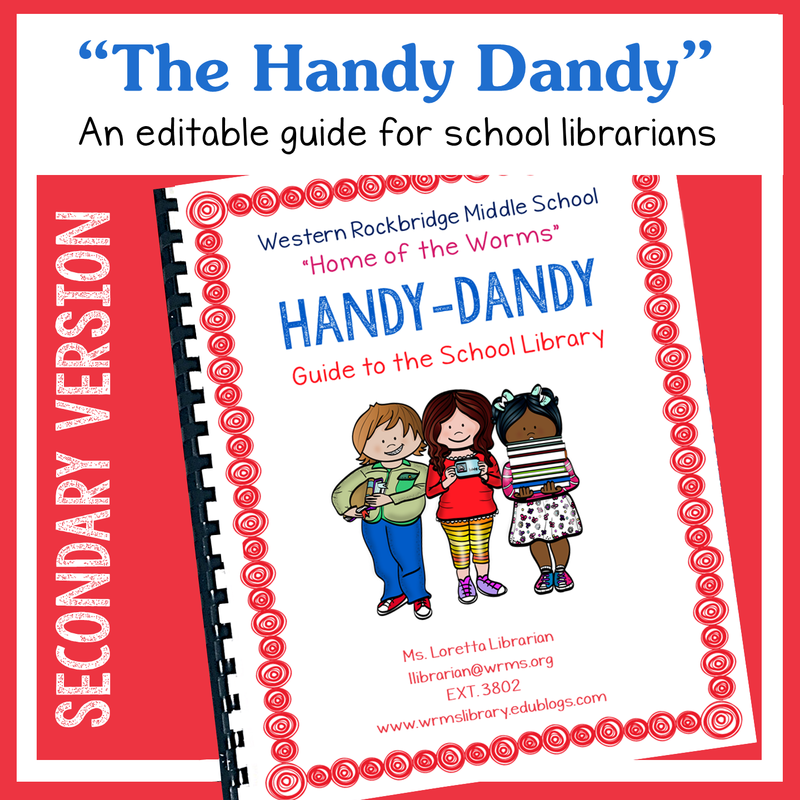 Introducing...The "Handy-Dandy" Guide to the Library! It is NOT NECESSARY to purchase both versions of the Handy-Dandy! The differences are minor, and you can edit all of the documents as needed. You, your teachers, and your principals are going to LOVE today's New Product Thursday! It will make your teachers' lives easier, and it will make you look like the polished, professional librarian you are (even if you don't always feel like it). It is especially perfect for new school librarians, new-to-your-school librarians, and Back to School in general. I'm releasing it well in advance of back to school so you'll have plenty of time to make it your own. So what is this life-changing, must-have idea? I'd like to introduce you to the "Handy-Dandy"! 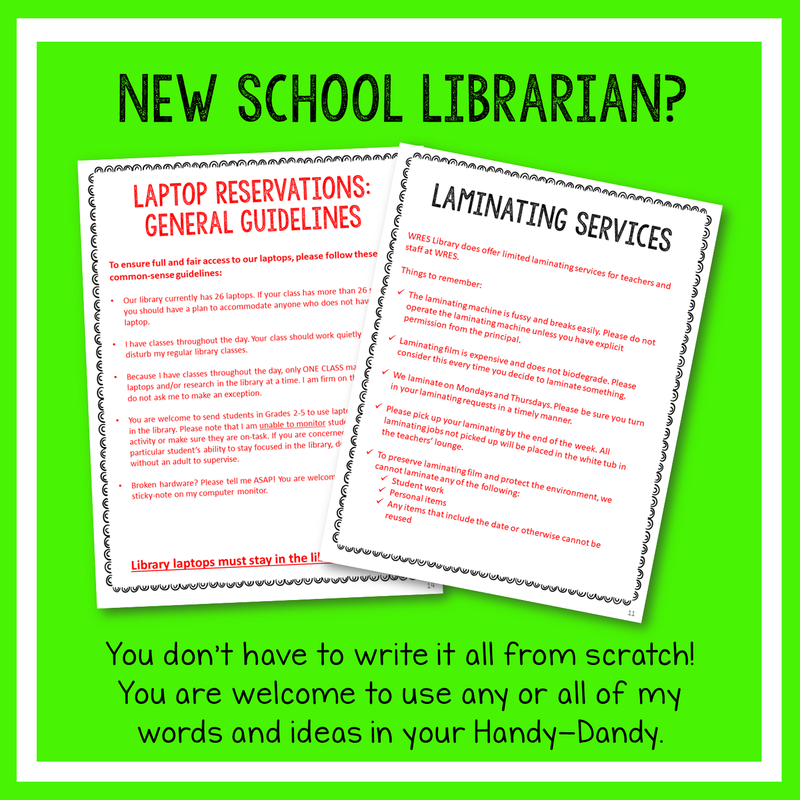 I created my first version of the "Handy-Dandy" in my second year as a librarian. I didn't intend for it to actually be called the Handy-Dandy, but that's how my teachers referred to it. 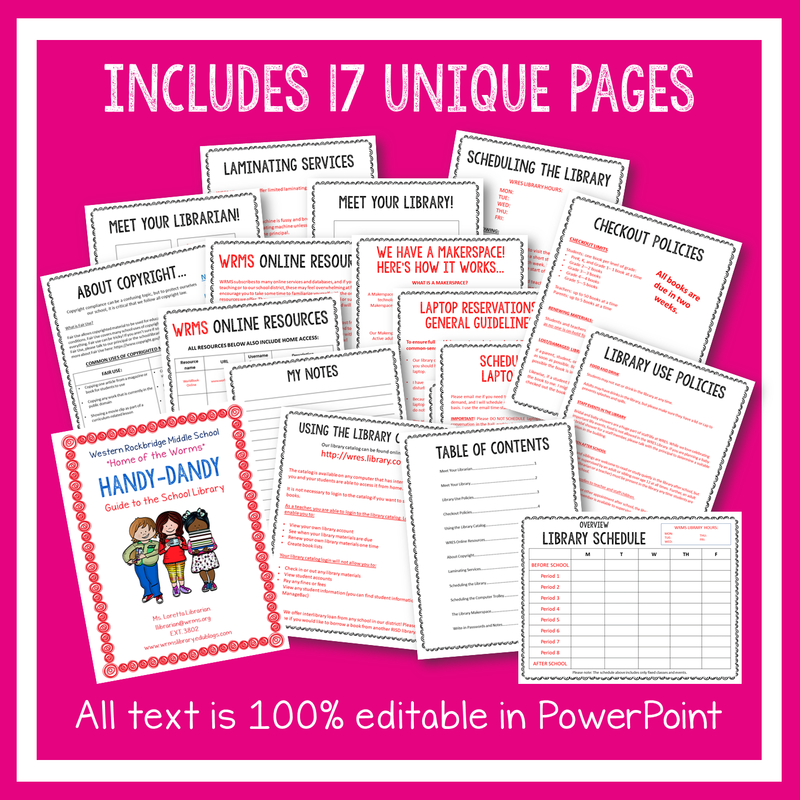 Teachers will love the Handy-Dandy because it includes all the pertinent library policies, database logins, library schedule, and other library information they need in one handy-dandy place. Bind it all together with comb binding and a clear cover, and your teachers are much more likely to keep it where they can get to it easily. 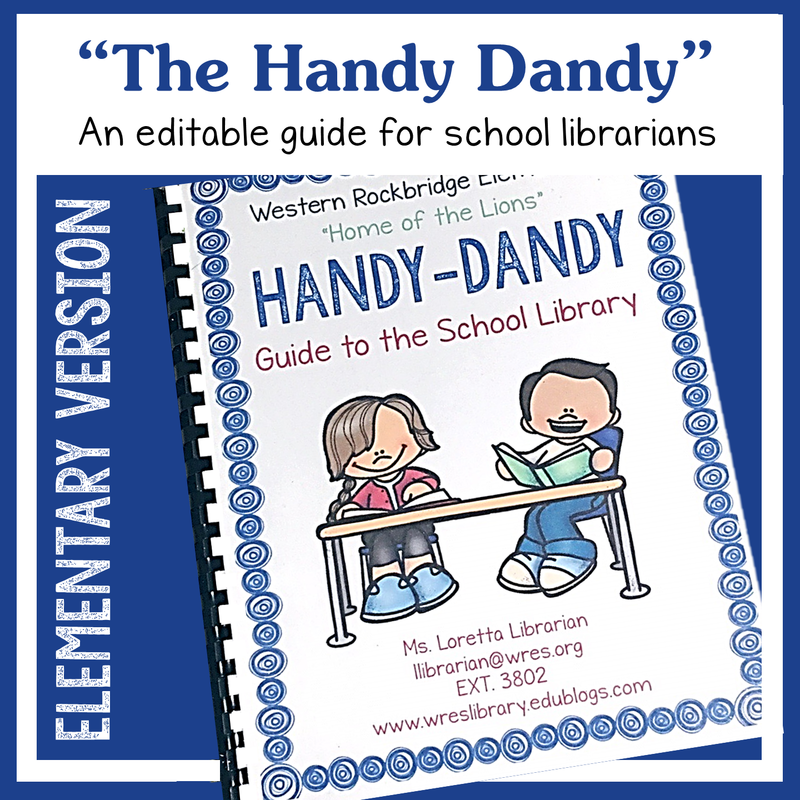 The Handy-Dandy is NOT your official library handbook, which should have been provided by your school district. Instead, the Handy-Dandy is a less-formal guide for the teachers in your building. Encourage your teachers to write in it and keep it in a "handy" location where they can access it easily and often. The Handy-Dandy is NOT a print-and-go resource. Though I've done a lot of the work for you, the Handy-Dandy will need some elbow-grease from you before it is ready for your teachers. Policies vary wildly from library to library, and I cannot write this part for you. I do include written policies that you can use if you like, but you will probably need to change at least some of the wording. Except for the graphics on the front cover and the page borders (which I am required to flatten and secure), the entire Handy-Dandy is editable. Since it's only February now, you will have plenty of time to edit and print it for Back to School in August. The Handy-Dandy is NOT set in stone. This is intended to be a fluid document that grows and changes from year to year. Policies, schedules, databases, logins, and philosophies will change over time. 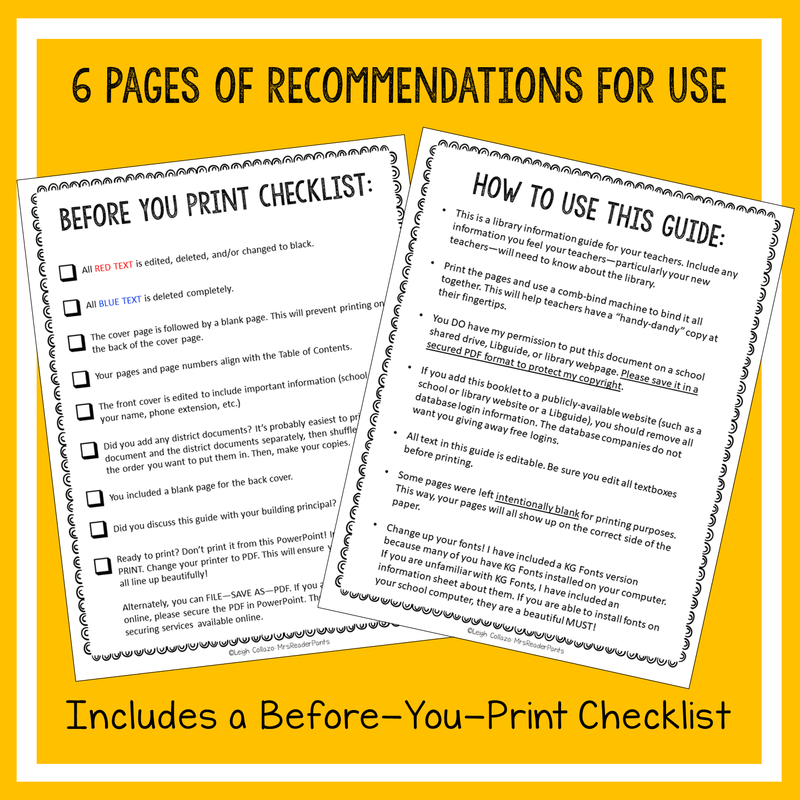 You will probably not need to print a new one every year, but you could if you needed to. Why so much red text on the Handy-Dandy? The red text is what must be edited for your school. The black text is universal for any library (though it may still be edited as needed). The Handy-Dandy includes 17 unique pages. Some of the pages, such as database logins, will need to be duplicated if you have many databases. You can easily do this in PowerPoint by simply duplicating the slides you need to add. I also included suggestions of district documents you might want to add, such as your district statement on copyright and your district's materials reconsideration (a.k.a. "book challenge") policy. Though these documents are usually (hopefully!) accessible on the school district website, teachers are super-busy and unlikely to dig for these important documents themselves. They are even less-likely to review them on a regular basis. Including them in the Handy-Dandy helps keep library-related district policies front-and-center for your teachers. In addition to six pages of advice on how and why to use the Handy-Dandy, The Handy-Dandy includes all of the pages listed below. I pre-wrote all the policies for you (especially helpful for newbies! ), so whether you edit a little or a lot, it will be easy to make it fit your library. The coolest part, especially for new librarians, is that I have already written out the entire Handy-Dandy! I created two imaginary schools (Western Rockbridge Elementary and Western Rockbridge Middle) and typed in policies that I have personally used--or wish I had used--in my own libraries. You may or may not agree with the policies I wrote, but they will give you a starting point to creating your own policies. If you are new to your school, it's a good idea to also go over the Handy-Dandy with your principal before you give copies out to teachers. You need to know your principal will support you on policies that may cause a kerfuffle with some of your teachers (such as a "no staff parties, baby showers, or bridal showers in the library" policy--I could write a whole post on that one). I included a list of other possible hot-button topics in the "Tips" section of the Handy-Dandy. I normally do not allow my products to be shared online or on shared school or district servers. But because the Handy-Dandy is so site-specific, I actually recommend making this document accessible on your school's library website, libguide, or shared server. Please DO NOT SHARE the editable PowerPoint version anywhere online. If you want to post your Handy-Dandy online, please make sure you only share it as a secure PDF. This will help protect my copyright while still allowing you to post your school's Handy-Dandy. There are many free sites and services available online that will help you secure the PDF. No matter what kind of library guide you use for your teachers, please make sure you are using something. They will need database logins, and no matter how often you send logins via email, many teachers will appreciate having all the logins at their fingertips. The Handy-Dandy (or other guide) will put all information teachers need to know about the library in one easy place. As a former teacher myself, I would have LOVED to have had something like this when I was in the classroom! Anything you can do to make your teachers' lives easier will be a huge score as a librarian! image above to go to my TPT store for this product.